Let’s take a walk in my garden. I have herbs, herbs and more herbs, with a few veggies and ornamental plants thrown in for fun. I teach herbal science classes at our local community college, so I bring in a lot of herbs to show students what they look like. I also dry a lot of my herbs to use in soap making classes and more. I sell my herbs, fresh and dried, herb plants and herbal products at tailgate markets around the area. So let’s take a walk and I’ll tell you what I have and what they can be used for. When you drive into the yard, the first things you’ll see are my many mint plants. I have 14 different kinds from Orange mint to Ginger mint. All of the mints are stimulating and all of them are antibacterial. I make a tea out of one of the mints, say-Chocolate mint, and I’ll drink part of it. Part of it I’ll cool and put into a spray bottle. It makes a very fragrant antibacterial counter top spray. Add a teaspoon or so of alcohol if you plan to keep it a few days. The next plants you’ll see are my culinary herbs. Basil, thyme, sage and rosemary. All of these are also antibacterial, but are also anti-fungal. Make a tea out of any of those, cool it some and soak your feet in it. Over time, it will eliminate athlete’s foot and toenail fungus. Spray some on your wood deck to get rid of mildew. Moving down the garden you’ll see tomatoes and potatoes. While these are not true herbs, they can be used as such. Simmer some tomato leaves in a pot, cool and strain, and spray on roses to get rid of aphids. Potatoes can be boiled, mashed, cooled and spread on sunburn. Rinse off after 15 minutes or so. It will soothe and protect your skin. Next is my “tropical” section. Ginger grows prolifically here in the summer. You’ll need to take tropical in during the winter, but leave them out all summer. Ginger is great cut up into water as a beverage. It helps to soothe stomach problems. My calamondin provides me with mini-oranges full of vitamin C. The castor bean plants I have produce seeds that should never be eaten. They contain the deadly poison ricin. That’s probably why the moles avoid them. I have lovely huge plants with umbrella like leaves and no moles. Bonus! I have hardy banana’s too, like many of my neighbors. They don’t produce fruit, but the leaves can be used for cooking. Enjoy this recipe using banana leaves and herbs. Take each banana leaf and place a piece of fish on top. Add the herbs to the top of the fish and a pat of butter and lemon on top of that. Fold the banana leaf so it forms an envelope. Place on a baking sheet and add a bit of water to the bottom of the pan. Bake at 350 degrees for 20-30 minutes, depending on the size of the fish. Check after 15 minutes. Open the package, discard herbs, and serve hot right on the leaf. Between the plants I have weeds, but not just any weeds. I have plantain in the sun and jewel weed in the shade. Plantain is very healing, so be sure to include it in your natural first aid kit. I dry it and use it in soaps to help heal bruises and scrapes. And jewel weed is the only thing I use to help get rid of poison ivy. It’s in my poison ivy soap and my newly formulated wipes. Just wipe the jewel weed solution on for a week, and the poison ivy should start to dry up. I also have a vitex tree, or chaste berry. The berries are dried and used in women’s tonics. My St John’s Wort yields yellow flowers that, when dried and infused into oil, turn the oil red. This is due to the active oil hypericin. It’s a nervine and gets deep into the nerves when applied to the skin. You can mix capsaicin with it and maybe turmeric, and use it for arthritis. It can help joint mobility. Another plant you’ll see in my garden is elderberry. It grows wild here and is a great plant to have around. You can deep fry the flowers. Dip them in beer batter and fry, dusting with powdered sugar just before serving. The berries should never be eaten raw, but you can dry them. Then you can make a glycerite out of them. Soak dried berries in vegetable glycerin a few weeks and strain. (Find vegetable glycerine here.) When you feel a cold coming on, take 5 drops a day, twice a day. It should help to kick the virus out of your system. If it’s too late and you already have a cold, take it anyway. It can help shorten the duration of a cold. Remember Sambucol? It’s made from the same thing. And finally you’ll see my hops along the fence, by the chickens. Yes, the hops are the same hops used to brew beer. I’m not a beer fan, so instead I use them for dream pillows. They help you to fall asleep, like lemon balm, another of my herbs. The two together make a tasty tea to be sipped just before bed. Take us for a walk through your garden and share what you’re growing this year! I love most of your posts and this one is a favorite of mine. I do not have a garden, now, second floor apartment. When I did have most of an acre to garden with my friends, I grew some of the things you mentioned. One friend, still beloved, wanted to plant many kinds of mint, right next to each other. Resulting in many cross breeds. When I stopped gardening, the mixed up mints took over. What herb books do you recommend? I have some doubts about some of the older books. I am willing to be convinced, though. 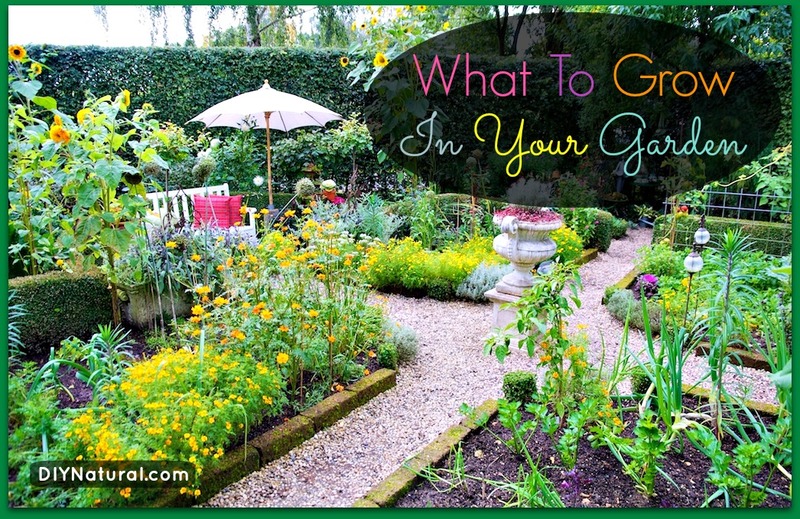 Who will take over your garden when you are in the RV? Just curious. Wishing you well in your work to connect folks with less expensive healthier ways of living. I share your site often. I have mostly moved from Facebook to Google+. I am still finding my way there. I don’t know if I have the power. If I do, I send you blessings and happy surprises. Thanks so much Evy! It’s too bad you can’t garden this year. Is there a community garden that you can rent some space from? We have them around here for around $30 a season. Or, you could try growing in pots on the windowsills. It’s not as productive, but you’ll get something out of it. When I lived in Swannanoa, NC, I was in a very small mobile home with no yard. The pots I had my plants in soon took over. I still use some of them today to bring my tropicals in and out. Thanks so much for your kind words. I wish you well! Can you suggest any herb for psorriasis that can be used on the skin? I live in Nova Scotia and would like to know if there is anything that could be grown here.Also I have a sunny spot 5’wide x 3′ high that is hilly by my driveway and would like to plant herbs there, can you suggest any, since they would keep the weeds away.Thankyou. What zone are you in? I’m guessing it may be 3 since a lot of Minnesota, where I’m from, is zone 4. You can grow any of the mints there. Some, like chocolate and pineapple, are slow to come back in the spring, but they will tolerate the cold. Any herbs you grow can be there in the summer, but may need to come in during the winter. Rosemary is one that will grow here, but not overwinter outside there. I keep my tropicals out all summer, but take them in when the night time temps get into the 50’s. In the spring, I put them out again when the night time temp’s go back into the 50’s. how do you use capsaicin in the oil? I take hot pepper flakes and cover them with an oil like canola. It’s a good weight to use for almost everything. Close the jar and leave it in the sun for a week or so. Strain the oil and store it in a cool place. If you use it on your body, or inside, use grapeseed or oilve oil. Canola is nfine too, but it doesn’t have the shelf life the others do. You can also put it in an oil sprayer and spray anything you don’t want bunnies to eat. They don’t like the hot pepper like we do! Thank you so much for sharing this information with us! Where did you get your calamondin? I got mine from Painter’s Greenhouse, a local grower in the area. If you don’t have a supplier nearby, look on the internet. I think Four Winds Growers has them, but I’m not sure. I’ll try to find some sources and get them to you. What a beautiful garden…………….would love to have one like this. I grow herbs in pots in back of the deck and we have a few tomato plants but nothing like you do……………….it is beautiful. Thank you! I’ve just moved and I swear, moving the plants is the worst! But when I look out over my garden, many gardens actually, I’m at peace. I’m working on a few new sections right now. I’m starting a native area and also a “Jurassic” garden. Here I’ll have plants that have been around for a long time, like ferns, gingko trees and aloes. It should be fun! Anytime you want to get a hold of me, you can email me. my email is [email protected]. I’m usually working so I can’t take calls very often, but I catch up with emails almost every night.